Prions are the infectious agents that cause Chronic Wasting Disease (CWD). Prions are abnormally folded proteins that lack DNA. They replicate by causing other normally folded proteins to rearrange themselves into a misfolded structure. The misfolded proteins accumulate in the brain, eventually leading to tissue damage and resulting neurological clinical signs and deficits. CWD prions concentrate primarily in the brain, spinal column, and lymph nodes of infected animals. They have also been found, in much lower concentrations, in various other tissues and fluids. Deer can transmit CWD prions to each other through saliva, urine, and feces. This has led to restrictions on the feeding and baiting of deer in many states. Whenever deer are congregated, such as at a feed or mineral site, there is increased risk of direct (i.e., nose-to-nose) and indirect (i.e., interaction with saliva, urine, or feces contaminated with CWD prions) contact. 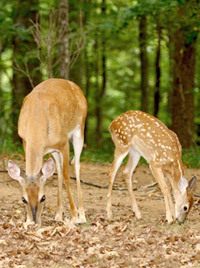 Increased direct and indirect contact between healthy and infected deer may amplify disease transmission within a population of susceptible individuals. CWD is considered an insidious disease for a variety of reasons, including the fact that infected deer may look completely normal for over a year before getting sick and eventually dying. During this time, they continually deposit infectious prions in the environment through their urine, feces, and saliva. 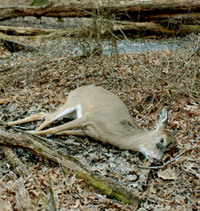 Another complicating factor of CWD is the fact that prions may remain infectious in the environment for years, primarily in the soil. Because of this, CWD may be spread within a population by sick deer interacting directly with healthy deer and via contact with soil contaminated with prions. Prions are very hearty proteins. They can be frozen for extended periods of time and still remain infectious. To destroy a prion it must be denatured to the point that it can no longer cause normal proteins to misfold. Sustained heat for several hours at extremely high temperatures (900°F and above) will reliably destroy a prion. Hunters are advised to wear gloves when handling deer carcasses and to clean equipment used on the carcass. While chemicals may not destroy a prion or render it inactive, prions may be manually removed or diluted with a disinfectant and scrubbing. There are a variety of prion diseases, many of which only infect one species. CWD has only been documented in North American cervids, including deer, elk, moose, and caribou. Some prion diseases, such as Bovine Spongiform Encephalopathy, are able to infect multiple species. Prion diseases vary in their incubation times. Most CWD research suggests incubation periods ranging from 16 months to four years, with an average of two years. CWD prions may remain infectious in soil for at least two years but likely longer. Prion diseases found in humans (such as Kuru and Variant CJD) are known to have incubation periods of several decades. This possibility – a multi-decade incubation period – has always been a matter of great concern for researchers trying to determine if CWD prions can infect humans. Since CWD was first reported in wild elk in the early 1980’s, efforts to determine if humans are susceptible to CWD have to consider the possibility that it may be too soon for symptoms to have developed. At this time, there is no known treatment or vaccine for CWD. All animals infected with CWD will invariably die of the disease.